HONG KONG, July 26, 2018 - (Media OutReach) - Teledyne e2v, a Teledyne Technologies company and global innovator of imaging solutions, announces its Emerald 67 megapixel, the newest member of its Emerald CMOS image sensor family. The new sensor features a high resolution with the smallest global shutter pixel (2.5um) on the market, enabling more objects to be captured in a single high resolution shot, ideal for high end automated optical inspection, microscopy and surveillance. Emerald 67M provides customers with ultra-low noise performance and only 2.8e- of readout noise. The sensor is highly sensitive with 70% QE, enabling precise defect and particle identification. It's also ultra high speed, which significantly enhances production line throughput. Designed to enable easy and cost-effective integration for camera makers, the new sensor is compatible with 59 x 59mm2 camera platforms and has optical and package centres that are fully aligned for easy integration. It has an APS-C optical format (unusual for such a high resolution sensor), up to 72 sub LVDS outputs and 8/10/12 bit conversion modes, all within a reliable ceramic uPGA package. 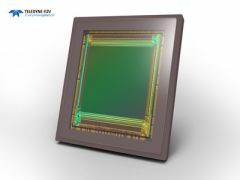 Vincent Richard, Marketing Manager at Teledyne e2v, said, "We are very pleased to widen our sensor portfolio with the addition of Emerald 67M, the first 8192 x 8192 global shutter sensor, running at high frame rates and offering a comprehensive set of features. Developed through close discussions with leading OEM's in the automated optical inspection market, this new sensor offers application features such as our unique Region of Interest mode, which helps to improve customer yield. Combined with its 67M resolution, our newest Emerald sensor tackles the challenge of image instability as a result of inspection system vibration."